GHD, is undertaking civil, structural and geotechnical design for the US$1.25 million ‘Active Travel Bridge’. The 60m-span bridge is due for completion in 2020 and will provide a link between a large residential area of Newtown and retail and employment areas, currently split by the River Severn with no direct access to one another. Detailed design is now under way. GHD is working with Ymgynghoriaeth Gwynedd Consultancy (YGC), Powys County Council, and the local community. 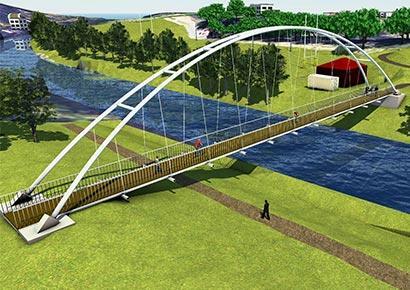 The final design option comprises a twin arch bridge with cable-supported deck. The steel structure will incorporate lightweight fibre-reinforced polymer deck panels and 9m high arches. GHD is recommending that the bridge be launched across the river instead of lifting it into place using a crane. The intention is to reduce the amount of heavy plant and lessen disturbance to the surrounding environment.